The UK ‘In Style’ October piece about clothes for work this winter includes mainly current versions of classic shapes. I’ve already suggested patterns for the skirt, dress, pants, and shirt. This is about the waistcoat (vest), blazer and coat, which may need more advanced sewing skills. A classic mannish style, v-necked and fitted. Worn a bit longer than usual, half way down the hips, if that length works for you. Fitted and over a soft blouse it doesn’t look masculine. McCall’s 5186, View C for length. This pattern has a lining. Not necessary to wear wide loose ‘boy friend’ shoulders if they aren’t for you, but the look is longer, just below the hips. Check which length is good on you. And make sure the jacket has enough ease to fit over your waistcoat or jumper dress plus blouse or thin sweater, if you need warmth. Making a jacket which is an extra layer for warmth or more coverage needn’t involve any special sewing skills. Most jacket patterns are not for blazers but for soft ‘dressmaker’ styles which involve less, or at least no more, skill than making a shirt. And there are several patterns for jackets that can be sewn in a couple of hours (see speedy layers post). Even making a blazer needn’t be a major investment in time. The Butterick 4138 2-hour sewing time jacket has no lining and no more interfacing than the usual blouse. But a ‘proper’ structured blazer keeps it’s shape well, by using special support for lapels, collar, and sleeve heads, with 2-piece sleeves. And added layers, not only a lining but perhaps multiple interfacings and underlining. Making one of these does involve more skill. Sigrid has a whole section of jacket making tutorials. There are 3 levels of difficulty for home sewers trying some tailoring, according to the book ‘Tailoring : a step-by-step guide’. Start at the easiest level, using fusible interfacing, with the new version of the Palmer-Pletsch jacket, McCall’s 6172 which they claim takes 8 hours sewing time (after practice !). This has 3 lengths, if the longer length is not a good proportion for you. Then if you want to, you can work through the levels of difficulty, using more complex support structures plus welt pockets and bound buttonholes, special pressing, and much hand sewing. Your blazer fabric doesn’t need to match the skirt or pants, unless you have a very conservative work environment. Current jacket fabrics can have a low contrast woven pattern – check/ plaid or herringbone. Substitute a long (thigh length) deep-V neck classic knit cardigan, or a high-hip length classic Chanel jacket (with a touch of waist shaping), if blazers aren’t for you. Again, making a true-to-style Chanel jacket with all the quilting and weighting chains involves special couture skills. But there are easier patterns with the basic Chanel shape. Here’s one with waist shaping, Vogue 7975. When you have the skills, you can make a major investment in time and beautiful hand stitching to construct one of Claire Shaeffer’s Couture jackets, perhaps Vogue 8333. There are many subtle variants of the basic blazer shape. And many patterns. 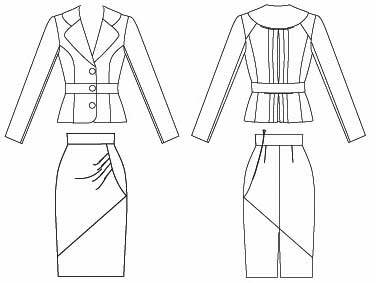 Here are some lovely designer patterns which need advanced sewing. 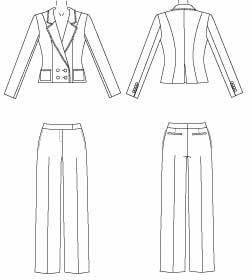 A skirt suit by Tracey Reese, Vogue 1126.
and Anne Klein, Vogue 1063. There are a couple of issues with these patterns and some of the other blazer variants, which mean they may not fit in with the ‘In Style’ wardrobe. One problem is they’re designed to look good when close fitting, worn perhaps over a camisole. They aren’t best suited to being expanded so they have enough ease to wear over several warm layers. They also have little sign of the current edgey sharp cornered androgynous ‘boy friend’ shape of the ‘In Style’ wardrobe. This doesn’t mean these styles are out of date. It’s just there are different versions of a ‘classic’ look. In his book ‘Metamorphosis”, David Kibbe separates traditional Classic from Dramatic Classic and Soft Classic, as 3 different personal styles. I would say the blazers in this section have the soft rounded curves of the Soft Classic look, while the ‘In Style’ blazer is crisper and more angular, a Dramatic Classic. If you like more traditional Classic styles, look at Fashion Sewing Group patterns by Nancy Erickson. Or “The Classics” by Cecelia Podolak (on-line from Haberman Fabrics, more information at her site). And also, ‘In Style’ is only giving one opinion about what to wear to look competent. In most types of work you don’t need to wear a blazer if you don’t like them. Cascade collar jackets and double breasted military style jacket are also current, if you do need a jacket. ‘In Style’ suggests a classic single breasted notched collar coat, a double breasted trench, or a double breasted pea-coat style with funnel collar. All are current. And all with a suggestion of waist shaping. There are coat patterns which are quick and easy, especially casual coats made of thick fleece. But making a classic warm coat expected to keep its shape and looks throughout daily wear for several years is more of a commitment. There’s much guidance in a past coat sew along. For a classic single breasted notched collar shape, there’s Vogue 1266. Or for a double breasted trench, McCall’s 5525. And a double breasted pea-coat style with funnel collar, such as Simplicity 2508 Project Runway pattern. If you’re not comfortable in the formality of a classic coat, the more informal current outerwear styles are a parka or a duffle coat. – several blouses/ shirts : plain, with frills, with a bow. – pants, skirt, jumper dress. – vest, blazer, Chanel jacket. Add a camisole, a couple of tees, some jeans, some fine classic sweater knits, perhaps a hoodie or jeans style jacket, and you’ll be covered for a lot more than just work. – If you’re really a romantic, add frills or bows, embroidered embellishment, lace trim, or soft fabrics for the blouses, with kitten heels and textured bags. – For greater comfort, make everything large enough to layer and move in easily, use plaids or herringbone weaves, wear quality classic fine knits instead of woven shirts, leather flat brogues or knee high boots (not real hiking boots !) and biker bags. – For added edge, wear a leather garment, leather or metal trims and buttons, a shirt with asymmetric opening, or studs, buckles and grommets on bags and shoes. – For more drama, go for this season’s high fashion thick soled shoes and big bags, or bigger shoulders, a statement necklace, and what can you do to liven up the linings of vests, jackets, coats ! Any non-extreme current style is worth investing time and effort in. Look at my post on the autumn/winter trends for 2009. The first 4 looks are still current. It’s only the extreme styles, aggressively pointed shoulders and tight corsets, that are not wearable any more. And happily there are now current softer ‘romantic’ styles. This entry was posted on September 18, 2010 at 8:56 am and is filed under current fashion, learning to sew, personal style, wardrobe planning. You can subscribe via RSS 2.0 feed to this post's comments. Both comments and pings are currently closed. Yes I’ve come to the conclusion that even though its not my normal style I need girlier blouses to wear with my waistcoats to give the right level of femininity. The goal is not to actually look like a bloke.